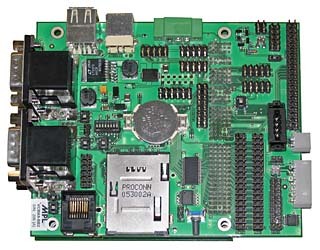 The VCMA9-BB2 is a small baseboard that fits directly on the highly integrated VCMA9 industrial single board computer. It is built to give easy connection possibility to all the different interfaces available on the VCMA9. Furthermore it offers a reset button, battery-backed SRAM, a combo socket for I-Stick or SD-Card, transistor logic for touch screen, a battery cell holder with logic to generate RTC power, and a '1.8V Alive power' supply to reach the lowest power down mode of the VCMA9. The VCMA9-BB2 needs only one supply voltage: +5VDC for VCMA9 and board logic. The +12VDC for CAN power, LCD backlight inverter and '1.8V Alive power' is generated on board from the +5VDC. For easy connection all connectors are available on the top side of the board. This gives you the possibility to mount the VCMA9-BB2 directly behind the front.